PT Hanjaya Mandala Sampoerna Tbk – PT HM Sampoerna Tbk (IDX : HMSP) or known as “HM Sampoerna” is a leading tobacco producers in Indonesia. 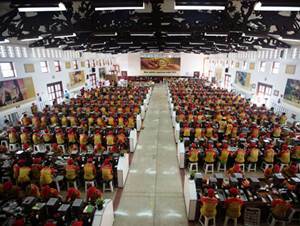 HM Sampoerna is widely known nationwide as one of the largest tobacco producers in Indonesia. HM Sampoerna controls about 33.4% share of market of the Indonesian cigarette market. HM Sampoerna operates primarily is a producers of the best-known kretek (clove) cigarette brand families with iconic brands such as Dji Sam Soe, Sampoerna A, Sampoerna Kretek, and Sampoerna U. HM Sampoerna is a public-listed company and its shares are traded on the Indonesia Stock Exchange (IDX) under reference code HMSP. HM Sampoerna is a local member of world leading tobacco company Philip Morris International. To date, HM Sampoerna is 92.75% owned by Philip Morris International through PT Phillip Morris Indonesia and 7.25% by general public. Based in Surabaya, HM Sampoerna now has 7 production facilities spread in all over Indonesia (as of December 2017). HM Sampoerna also supported by 38 Third Party Operators (TPOs) and 9 subsidiaries; PT Perusahaan Dagang dan Industri Panamas, PT Union Sampoerna Dinamika, PT Wahana Sampoerna, PT Harapan Maju Sentosa, PT Persada Makmur Indonesia, PT Handal Logistik Nusantara, PT Taman Dayu and Sampoerna International Pte. Ltd. HM Sampoerna sells and distributes cigarettes through a total of 105 sales offices throughout Indonesia. In term of financial performance, HM Sampoerna generally recorded a positive financial performance in the business year of 2016. According to information found PT HM Sampoerna Tbk Annual Report 2016 as cited by JobsCDC.com, HM Sampoerna reported a 7.18% growth in total sales value in 2016 worth of Rp 95.46 trillion. HM Sampoerna registered total sales value in 2015 amounted to Rp 89.06 trillion. Referring to its annual report, HM Sampoerna reported total comprehensive income attributable to owners of the parent of Rp 12.53 trillion. This number is up 21% from the previous year of Rp 10.35 trillion. University degree in Marketing, Advertising, Communication and/or additional certificates. Minimum 5 years of experience in Media Specialist, Media Agency. Required experience in Media and Connection planning. Exceptional data analytics and numeracy skills. Capable to connecting data, articulate it into actionable insights. Have passion for out of the box creative thinking. Strong drive for good result, self-starter and initiative. Great social interpersonal, team player, and communication skills. Minimum 2 years of experience of creative industries, marketing, brand activation or digital activation. Background of Startup industry or Digital Activation will be an advantage. Creative, passionate and good sense of collaborating. Having a strong analytical skills. Have a good project management skills. Have a good interpersonal communication skills.